STONEHENGE SPEAKS is about archaeology and anthropology, not the prosaic kind about bits of broken pottery and primitive savages clothed in fur skins, it is about people given the gift of imagination and creative thought. History is history, prehistory is often thought of as the time when writing was unknown; a simplistic attitude by those who have not learnt to read the story, an attitude that belittles our forebear’s skills forming a record in a readable form. “Stonehenge Speaks” concerns the sea-linked peoples of Ireland, Britain and north-west Europe, the “Old People” who are seen to have thought about life and its problems more than eight thousand years ago. They created artefacts and monuments in their own time, memorials made so we could understand their thinking, writing, reading and demonstrated mathematical skills combined with archaeoastronomical knowledge. The story in this book has been arranged from the present to the past, similar to researching a family history, from the known to the unknown. From the present that we know about, to history in books and then to prehistory that extends to the far distant past in Scotland. 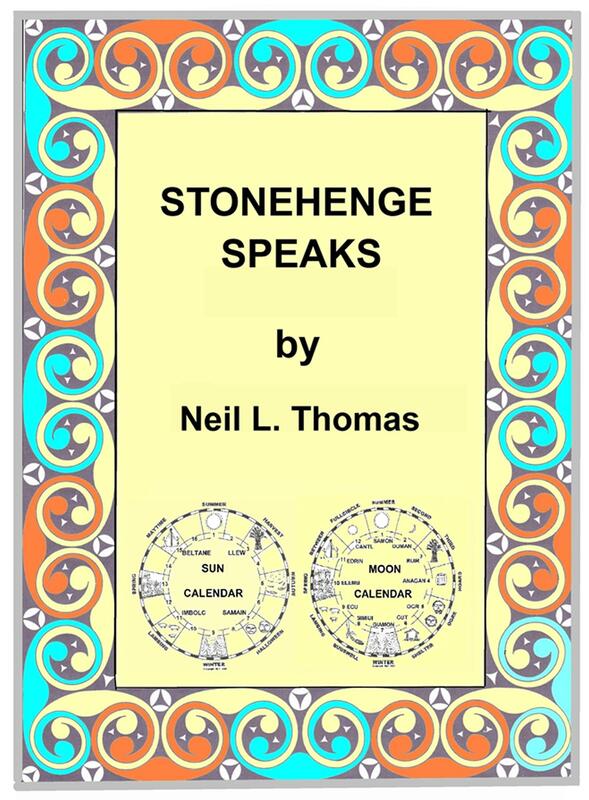 Founded on decades of research both here and in Europe, “Stonehenge Speaks” explains the “Old Peoples” legacy to us from many sources in understandable and informative terms. Thirty-three has been in use since 3500 BC to mean or imply regal, sacred, heavenly, the Otherworld, a form of symbolism that continues today. Of major importance are the newly detailed accounts of the Stonehenge Sun and Moon calendars, the Ness of Brodgar petroglyphs and the Rhondda Calendar dated 4270 BC, the latter seen as the first writing in human history; immediately readable and comprehensible, millennia earlier than Sumerian cuneiform and Egyptian cartouche inscriptions. Locations include Washington D.C., USA, Wales, Scotland, Ireland, England, Denmark, France and Germany. Author Dr Neil L Thomas, a chartered engineer in the Australian oil and gas industry, made field trips to Ireland, Wales, England, Scotland, the Netherlands, Denmark, France, the Middle East, Egypt, India, China, Canada and the USA. Years of research led to an understanding how the myths and folklore of north-west European peoples complement prehistoric monuments, the evidence fits together like a jigsaw. “In 1977 Dr Thomas like many Australians with Celtic surnames before him, went searching for his ancestors, only to stumble across an entirely pre-Celtic civilisation. His casual interest rapidly deepened, after twelve years of intensive scholarship he presented a brilliant PhD thesis – perhaps even definitive – in its interpretation of Britain and Ireland’s Neolithic culture. From the vantage point of his training in engineering and mathematics, Dr Thomas obtained a fresh perspective of the design and function of the megalithic circles in Britain and Western Europe. Dr Thomas believes these ancient Britons worshipped the Sun and Moon, and probably gods corresponding to the three primary gods of the Norse pantheon – Odin Thor and Freyr. Although Stonehenge is the best-known of Britain’s Neolithic relics, a much larger stone circle lies to the north-west, surrounding the village of Avebury. From its grand design, and its relationship to other megalithic sites in the region, Dr Thomas believes Avebury was the most significant of all the Neolithic temples. Avebury’s massive ring of stones, some weighing up to 45 tonnes, originally numbered 99 – thrice the sacred number of 33. If Dr Thomas is right, Avebury was ancient Britain’s spiritual capital, the Neolithic equivalent of Jerusalem"
Graeme O’Neill, past Science Correspondent of ‘The Age’ broadsheet newspaper, Melbourne. Discovered the special properties of right-angled triangles, supposedly defined by Pythagoras about 550 BC. Known about the [22/7] relationship between a circle’s circumference and its diameter, pi. Developed a reliable system of measuring distances and angles. “Among his original insights, Dr Thomas has described the likely role in pre-Celtic society of the enigmatic Long man of Wilmington, a giant figure holding two staves, carved into the chalk of a hillside in Sussex. Dr Thomas argues, on the basis of the ancient units of measurement that recur in Britain’s megalithic structures and the precision of these measurements, that the Long Man was a surveyor who is holding the tools of his profession. He has calculated that the staves were used to measure a 2.073 metre length, the megalithic rod. The Long Man measures 33 megalithic rods from head to toe. Dr Thomas says the Long Man’s height is significant because when multiplied by 33 it yields another recurrent unit of distance: the megalithic mile [the country mile].” Ed. Editor, the Monash University Research Review.